HomeFAQ – FAR Part 117FAQ – Daily Flight Duty Time Limitations – Un-Augmented Flight Crew. FAQ – Daily Flight Duty Time Limitations – Un-Augmented Flight Crew. One of the regulatory concepts that this rule introduces is the restriction on flightcrew members’ maximum FDP. the number of flight segments that a flightcrew member is scheduled to fly during his or her FDP. The FAA also introduced penalties for un-acclimated operations. Q11) How is FDP calculated? A11) FDP is measured from the time a pilot reports with the intention of flight to the arrival time (IN time) of the last operating flight, or when the carrier notifies a pilot that there is no further intention of flight in the FDP, (117.3 Definitions – Flight duty period ). Q12) What are the flight duty time limitations for a flight crewmember assigned to a FDP as a member of a 2-pilot flightcrew? Q13) If a flight crewmember is re-scheduled during a FDP from 3 flight segments to 5 flight segments, is the FDP limitation based upon 3 or 5 segments? Q14) If a flight crewmember has a diversion during a FDP that causes an increase in flight segments from 4 to 5 segments, is the FDP limitation based upon 4 or 5 segments? Q15) If a flight crewmember is assigned to a FDP with 4 flight segments and is subsequently re-scheduled to 2 different flight segments after operating the first 2 flight segments must a re-evaluation of the FDP limits occur? A15) Yes, 117.13(a) no certificate holder may assign and no flightcrew member may accept an assignment for an un-augmented flight operation if the scheduled flight duty period will exceed the limits in Table B of this part. 117.13 Flight duty period: Un-augmented operations. (a) Except as provided for in § 117.15, no certificate holder may assign and no flightcrew member may accept an assignment for an unaugmented flight operation if the scheduled flight duty period will exceed the limits in Table B of this part. 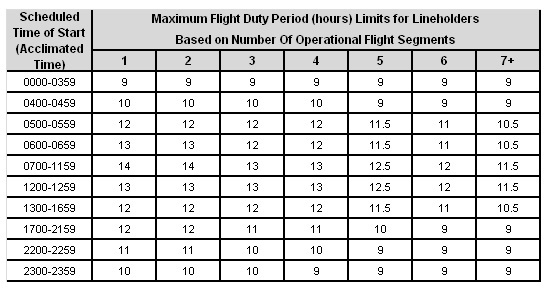 (1) The maximum flight duty period in Table B of this part is reduced by 30 minutes. (2) The applicable flight duty period is based on the local time at the theater in which the flightcrew member was last acclimated. FAQ – Daily Flight Time Limitations. FAQ – Daily Flight Duty Time Limitations – Augmented flightcrew. Ok, where am I wrong? I can always learn.